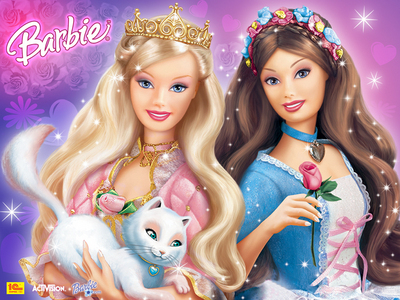 Which Barbie Filme do u prefer?-the old ones oder the new ones, and why? I prefer the old Filme mostly because they have a better plot , a better story ,better songs , better characters and also it has less fuchsia and doesn't have eye hurting colors. And about the Animation I think the Animation in the new Filme is clearer and better at some point but I prefer the facemolds in the old movies. Old Barbie Filme are way better. From the animation, Musik (songs and background musics), characters, and many more! Though the main theme songs of old BMs have deeper lyrics then in the new BMs, example "Shine", "Hope Has Wings", "I'm on My Way", etc. The old BMs heroines are braver and inspiring. Each of them have special side and personality like manu962 said. It seems like Mattel is spoiling little girls with making those magenta oder fuschia sparkles, cheap magic things (magic microphone and hairbrush) and also silly sparkling fashions in the new BMs scenes like in FF, FS, and PaP. I have to say I'm very disappointed with PaP because of those cheap magic things. First, BMs usually tell about how the magic things can be found. While in PaP, the magic things have been found, I think Steve Granat and Cydne Clark didn't have to add magic mic and hairbrush, just let the Diamond Gardenia be the only magic thing in PaP. Second, I think a popstar should be a normal human being and never touch with magic. Because of the magic microphone and nonsense fast-changing stage, Keira looks Mehr like magician and not like a singer, so her konzert doesn't look like a Musik konzert and it's kind of magic Zeigen where Keira is the magician. I like Keira's hair, electric guitar, dress, style, and also her Singen voice (Tiffany Giardina). But for the role as a fictional popstar, I like Hannah Montana Mehr since she's Mehr realistic. If Du think Keira is nonsense, then why do Du have her as your icon? I forgot to say that. I don't think Keira is nonsence. I agree that magic is a bit fake in PaP but I think Keira represents the life of a popstar is an awesome way. I never watched Hannah Montan at all. Something between. The Nutcracker, Rapunzel, schwan Lake and A Weihnachten Carol are wonderful, but not new - so a little bit boring, although the stories are good and the characters lovely. 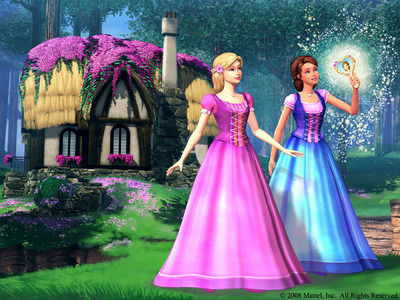 Between Fairytopia and the Diamond schloss the stories are very good, also the characters. After this the stories, characters and graphic are getting worse. Glittering, Sparkling seems to be the most important think of the new movies. The old Barbie movies! Because they are Mehr interesting. But modern Barbie Filme are too predictable. I Liebe ballet which I can't see in the new movies, and there is no classic Musik also. I Liebe intelligent Anneliese, Merida - Legende der Highlands Odette, freedom-loving Rapunzel, hopeful Annika...and others. But the new Barbies don't have these qualities. So, that's why I Liebe old Barbie Filme and don't like the new ones. I prefer the older films, for a number of reasons. For one thing, I feel like the Animation was better. Okay, it was stiff in some of the earlier Filme - I'd say the Filme from MoP to IP had the best Animation insgesamt - but the characters looked better and the lighting and backdrops actually looked somewhat Mehr realistic. The Filme nowadays tend to be a lot brighter and shinier, although the backgrounds and buildings have improved lately. Secondly, and this is perhaps Mehr important, I feel like the stories were better in the older movies. At least, I feel like Mattel put Mehr effort into the stories back then than they do now. That goes double for the characters. This doesn't mean to say that the new Filme are all bad, oder that they're all guilty of this (PCS, for instance, was actually done quite well in terms of story and such) but they just don't tend be as good overall. While the new Barbie movie in my opinion less interesting story, and a bit boring to watch. It is not clear what is to be conveyed from the story. As the Princess and Popstar, I was disappointed with the movie. Because the story is not clear, it is not well targeted. The old ones, because I find the plot lines, Musik and characters much better, and I prefer the Animation in the old ones too. Sorry, I realise this is an old post, I had to have my input though! The old ones. There the ones I grew up with, and frankly, I like them alot more. The only good modern Barbie movie I can think of is a fashion fairytale, but its still not as compelling as the diamond castle, nutcracker, oder rapunzel. The old ones had Mehr charm, and kühler stories and Mehr inspiring main characters. There were even some Du didn't expect to be good, but were, like mermaidia, mermaid tale and magic of the pegasus. New Barbie writers, take lessons from the old ones. The old Filme are much better.They had better plots,characters,moral lessons,animation and music. I also prefer how Barbie's face looked in the older movies. The old ones! Back then, the Animation was much better, the plots were interesting and exciting, and the characters were actually not just stereotypes of stereotypes! Since 2010, the Filme have become complete and utter glitzy girly crap. And the reason.....I don't know,I guess I just happen to like classic fairy tales(or something set in that age) very much,while also like to saw Barbie dress up in old-fashion gown/dresses,and "magical transformations". I think there are two kinds of Barbie movies. The Barbie movie with a really good plot, characters and animation. 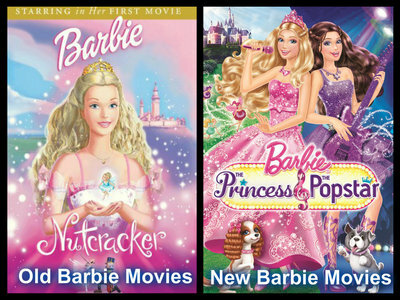 And the Barbie Filme that are the mini-movies. The mini Filme are like the novellas of series and novels. But anyway, the new Barbie Filme like "The Secret Door", "Fashion Fairytale" and "Princess Charm School" are those Barbie Filme that are in the level of classic Barbie movies. And then, there's the "Princess Power" and the others-- who lack the plot and excitement of watching Barbie. Honestly, I'm kind of disappointed to see Barbie--and the animation-- get worse. I'm even disappointed that getting a Liebe interest is not their focus anymore! I mean, who's Barbie when Du don't have Ken, right? So anyway, I just liked those good Barbie Filme rather than the new ones from "Princess Power" up to the "Puppy Chase"
I really Liebe the in between ones. My most Favorit is Barbie in a Mermaid Tale. I Liebe the story of it. I like the old ones too. Also, Barbie Princess and the Pop-star is okay-ish to me. I don't like Filme that have such a small setting (like Barbie and the 12 Dancing Princesses). It feels weird oder I don't know how to say it, but just weird, when the Filme doesn't take place in a big setting oder Mehr than one place. I don't know. Does anyone understand that? I Liebe Barbie in Princess Charm School too. I hate it when they have Barbie play as herself. I like when she is being the actress. Another one of my Favoriten is Barbie as the Island Princess. The older ones have better story lines, better, I don't know, but better feels to them I think. Sorry if I upset anyone Von saying this, but it is just how I feel about it. I have some in the Liste that are older that I still don't like, but I absolutely do not like any of the new ones like Princess Power, Spy Squad, Video Game Hero (especially), delphin Magic, oder Rock n' Royals. I did not include star, sterne Light Adventure in that because I like that movie. No, I did not like the ending that much, but I feel like the movie had good intentions. It could have been better if it seemed a little longer and if it had a different ending that went along Mehr when the other older movies. Okay, I came back after watching previews of the newer Barbie movies, and this is why I hate them: If Du go and look at Princess Charm School oder Mermiad Tale Du see that the person Barbie plays as looks the same. Go look at the newer Filme like Princess Power oder Rock n' Royals, they look completely different. I am so used to the way Barbie looked in the older Filme that seeing her in the new Filme is weird. 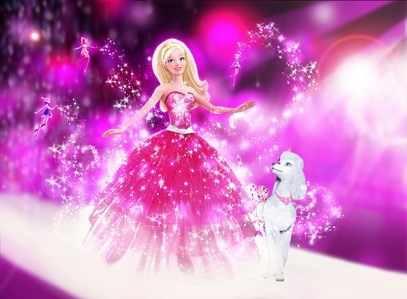 star, sterne Light Adventure is not as bad to me because Barbie doesn't look too different from the older movies. I really Liebe Barbie movies, but the changes are literally killing me.